As Twain’s books provide insight into the past‚ the events of his personal life further demonstrate his role as an eyewitness to history. During his lifetime‚ Sam Clemens watched a young United States evolve from a nation torn apart by internal conflicts to one of international power. He experienced America’s vast growth and change—from westward expansion to industrialization‚ the end of slavery‚ advancements in technology‚ big government, and foreign wars. And along the way‚ he often had something to say about the changes happening in his country. Samuel Clemens was born on November 30‚ 1835, in Florida‚ Missouri‚ the sixth of seven children. At the age of 4‚ Sam and his family moved to the small frontier town of Hannibal‚ Missouri‚ on the banks of the Mississippi River. Missouri, at the time‚ was a fairly new state (it had gained statehood in 1821) and comprised part of the country’s western border. It was also a slave state. Sam’s father owned one slave and his uncle owned several. In fact‚ it was on his uncle’s farm that Sam spent many boyhood summers playing in the slave quarters‚ listening to tall tales and the slave spirituals that he would enjoy throughout his life. At 18‚ Sam headed east to New York City and Philadelphia‚ where he worked on several different newspapers and found some success at writing articles. By 1857‚ he had returned home to embark on a new career as a riverboat pilot on the Mississippi River. With the outbreak of the Civil War in 1861‚ however‚ all traffic along the river came to a halt‚ as did Sam’s pilot career. Inspired by the times‚ Sam joined a volunteer Confederate unit called the Marion Rangers‚ but he quit after just two weeks. In search of a new career‚ Sam headed west in July of 1861‚ at the invitation of his brother‚ Orion‚ who had just been appointed Secretary of the Nevada Territory. Lured by the infectious hope of striking it rich in Nevada’s silver rush‚ Sam traveled across the open frontier from Missouri to Nevada by stagecoach. Along the journey Sam encountered Native American tribes for the first time as well as a variety of unique characters‚ mishaps, and disappointments. These events would find a way into his short stories and books‚ particularly Roughing It. After failing as a silver prospector‚ Sam began writing for the Territorial Enterprise‚ a Virginia City‚ Nevada‚ newspaper where he used‚ for the first time‚ his pen name‚ Mark Twain. Wanting a change by 1864‚ Sam headed for San Francisco where he continued to write for local papers. In 1865‚ Sam’s first “big break” came with the publication of his short story‚ “Jim Smiley and His Jumping Frog, ” in papers across the country. A year later‚ Sam was hired by the Sacramento Union to visit and report on the Sandwich Islands (now Hawaii). His writings were so popular that‚ upon his return‚ he embarked upon his first lecture tour‚ which established him as a successful stage performer. Hired by the Alta California to continue his travel writing from the east‚ Sam arrived in New York City in 1867. He quickly signed up for a steamship tour of Europe and the Holy Land. His travel letters‚ full of vivid descriptions and tongue-in-cheek observations‚ met with such audience approval that they were later reworked into his first book‚ The Innocents Abroad, in 1869. It was also on this trip that Clemens met his future brother-in-law‚ Charles Langdon. Langdon reportedly showed Sam a picture of his sister‚ Olivia‚ and Sam fell in love at first sight. After courting for two years‚ Sam Clemens and Olivia (Livy) Langdon were married in 1870. They settled in Buffalo‚ New York‚ where Sam had become a partner‚ editor, and writer for the daily newspaper the Buffalo Express. While living in Buffalo‚ their first child‚ Langdon Clemens‚ was born. In 1871‚ Sam moved his family to Hartford‚ Connecticut‚ a city he had come to love while visiting his publisher there‚ and where he had made friends. Livy also had family connections to the city. For the first few years the Clemenses rented a house in the heart of Nook Farm‚ a residential area that was home to numerous writers‚ publishers, and other prominent figures. In 1872‚ Sam’s recollections and tall tales from his frontier adventures were published in his book‚ Roughing It. That same year the Clemenses’ first daughter Susy was born‚ but their son‚ Langdon‚ died at the age of two from diphtheria. In 1873‚ Sam’s focus turned toward social criticism. He and Hartford Courant publisher Charles Dudley Warner co-wrote The Gilded Age‚ a novel that attacked political corruption‚ big business, and the American obsession with getting rich that seemed to dominate the era. Ironically‚ a year after its publication‚ the Clemenses’ elaborate 25-room house on Farmington Avenue‚ which had cost the then-huge sum of $40‚000-$45‚000‚ was completed. For the next 17 years (1874-1891)‚ Sam‚ Livy, and their three daughters (Clara was born in 1874 and Jean in 1880) lived in the Hartford home. During those years Sam completed some of his most famous books‚ often finding a summer refuge for uninterrupted work at his sister-in-law’s farm in Elmira‚ New York. Novels such as The Adventures of Tom Sawyer (1876) and Life on the Mississippi (1883) captured both his Missouri memories and depictions of the American scene. Yet‚ his social commentary continued. The Prince and the Pauper (1881) explored class relations as did A Connecticut Yankee in King Arthur’s Court (1889), which‚ going a step further‚ criticized oppression in general while examining the period’s explosion of new technologies. And‚ in perhaps his most famous work‚ Adventures of Huckleberry Finn (1884)‚ Clemens‚ by the way he attacked the institution of slavery‚ railed against the failures of Reconstruction and the continued poor treatment of African Americans in his own time. Huckleberry Finn was also the first book published by Sam’s own publishing company‚ The Charles L. Webster Company. In an attempt to gain control over publication as well as to make substantial profits‚ Sam created the publishing company in 1884. A year later‚ he contracted with Ulysses S. Grant to publish Grant’s memoirs; the two-volume set provided large royalties for Grant’s widow and was a financial success for the publisher as well. Although Sam enjoyed financial success during his Hartford years‚ he continually made bad investments in new inventions‚ which eventually brought him to bankruptcy. In an effort to economize and pay back his debts‚ Sam and Livy moved their family to Europe in 1891. When his publishing company failed in 1894‚ Sam was forced to set out on a worldwide lecture tour to earn money. In 1896‚ tragedy struck when Susy Clemens‚ at the age of 24‚ died from meningitis while on a visit to the Hartford home. Unable to return to the place of her death‚ the Clemenses never returned to Hartford to live. From 1891 until 1900‚ Sam and his family traveled throughout the world. During those years‚ Sam witnessed the increasing exploitation of weaker governments by European powers‚ which he described in his book, Following the Equator (1897). The Boer War in South Africa and the Boxer Rebellion in China fueled his growing anger toward imperialistic countries and their actions. With the Spanish-American and Philippine War in 1898‚ Sam’s wrath was redirected toward the American government. When he returned to the United States in 1900‚ his finances restored‚ Sam readily declared himself an anti-imperialist and‚ from 1901 until his death‚ served as the vice president of the Anti-Imperialist League. In these later years‚ Sam’s writings turned dark. They began to focus on human greed and cruelty and questioned the humanity of the human race. His public appearances followed suit and included a harshly sarcastic public introduction of Winston Churchill in 1900. Even though Sam’s lecture tour had managed to get him out of debt‚ his anti-government writings and speeches threatened his livelihood once again. Labeled by some as a traitor‚ Sam wrote several works in this period that would not be published in his lifetime either because magazines would not accept them or because of a personal fear that his marketable reputation would be ruined. In 1903‚ after living in New York City for three years‚ Livy became ill and Sam and his wife returned to Italy where she died a year later. 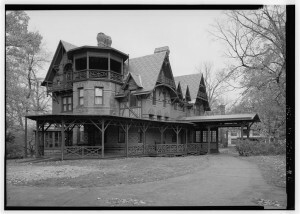 After her death‚ Sam lived in New York until 1908 when he moved into his last house‚ “Stormfield,” in Redding‚ Connecticut. In 1909‚ his middle daughter Clara was married. In the same year Jean‚ the youngest daughter‚ died from an epileptic seizure. 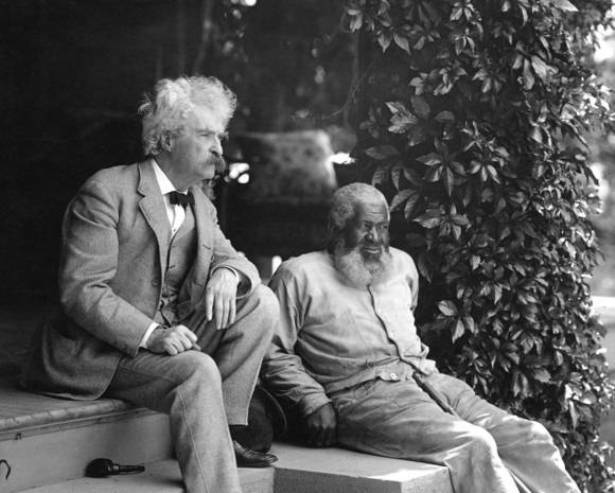 Four months later on April 21‚ 1910‚ Sam Clemens died at the age of 74. This article is courtesy of The Mark Twain House & Museum and first appeared on their website as an essay in their the MAN section. Clemens, Samuel L. Patent Number 140,245 - Improvement in Scrap-Books. 140,245. 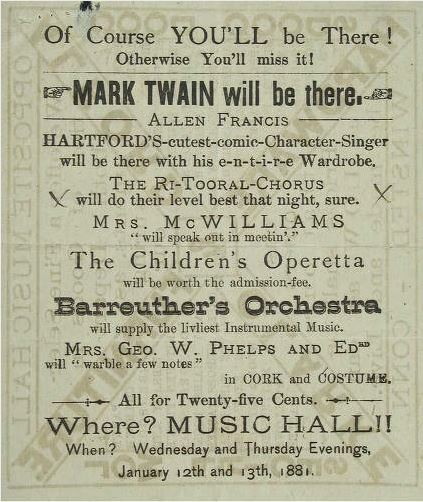 Hartford, CT, issued 1873. Link. 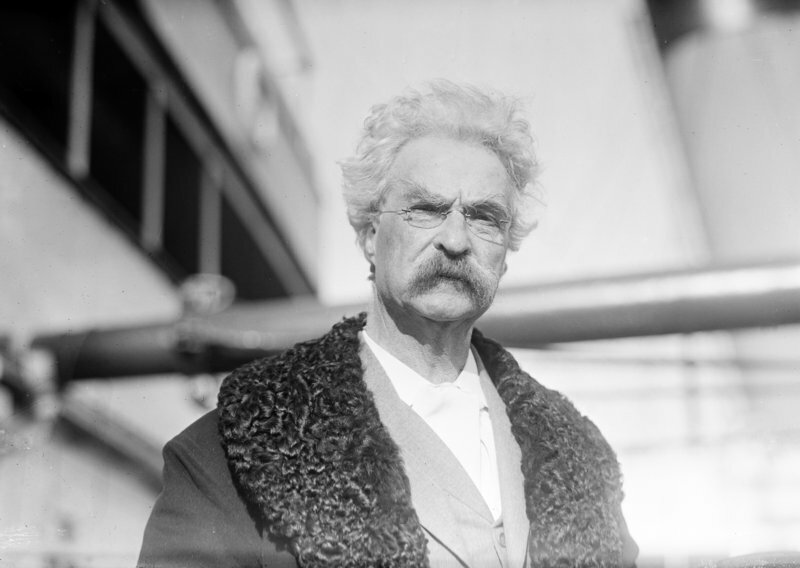 “The Mark Twain Papers and Project.” University of California, Bancroft Library, 2016. Link. Shelden, Michael. Mark Twain: Man in White: The Grand Adventure of His Final Years. New York: Random House, 2010.